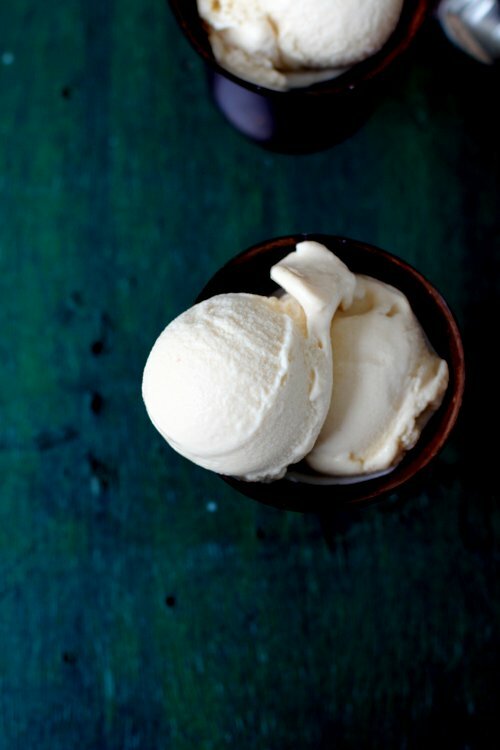 I am going to share with you an absolutely easy basic vanilla ice cream that you can make at home almost effortlessly. 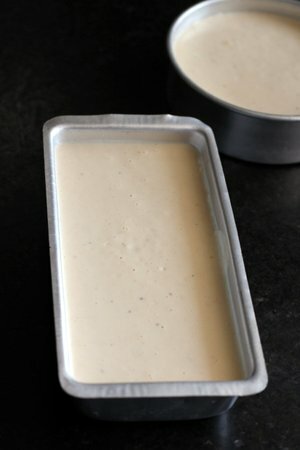 I am not sure why it took me so long to post vanilla ice cream recipe. In fact, I had made this all time favorite frozen dessert more than two weeks ago when the temperatures were soaring and unbearable. Yes, the month of May is the ice cream season of India. 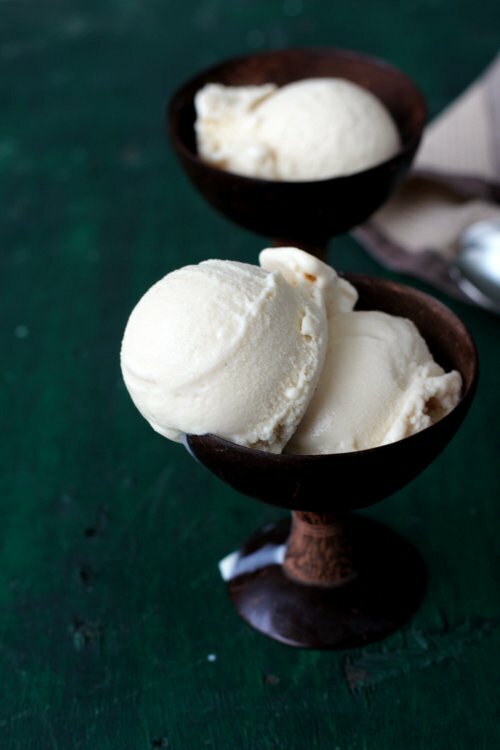 The secret ingredient that gives ice cream its creamy, soft and incredibly smooth texture is corn flour. If I want to serve ice cream as an after dinner dessert, I usually boil the milk around breakfast time and allow it to come to room temperature. Around noon, when I cook lunch I finish the ice cream making process and freeze it. Between lunch and tea time, I am done with stirring the ice cream mixture at least 4 times and the finally I blend the slush textured icecream mixture in a blender before freezing it. 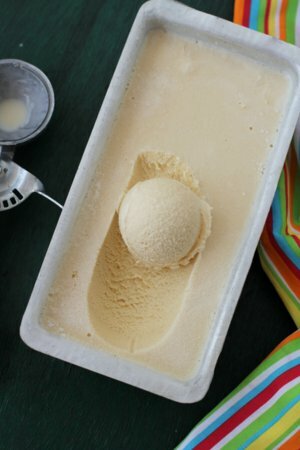 If you avoid mixing the cold ice cream mixture, you will end up with a hard, frozen block of ice. It will be impossible for you to scoop the ice cream off the container. 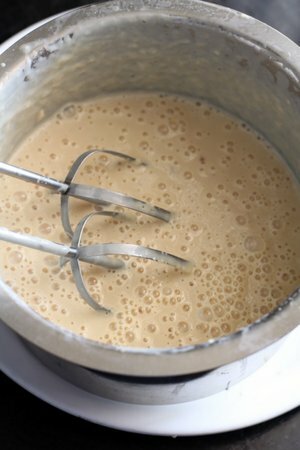 The stirring and blending is essential to restrict the formation of ice crystals and yield a soft, light, smooth textured ice cream that can be easily scooped. 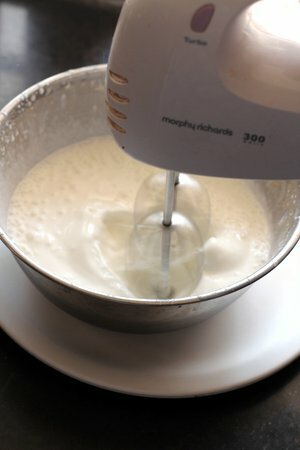 After many attempts of trying to create that perfect textured ice cream that does not melt quickly, I have settled with this tried and tested ice cream recipe. 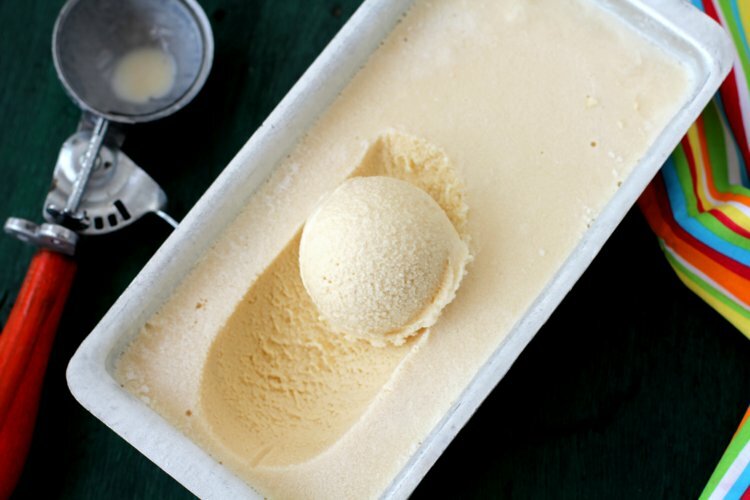 This style of ice cream is different from the French style ice cream that uses eggs to make a custard base. 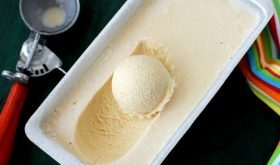 Popular Philadelphia style ice cream uses only milk and cream. Believe me, this eggless dessert is insanely delicious. 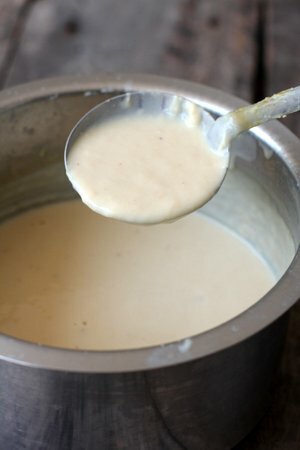 Simple, foolproof recipe of ice cream that is eggless and can be made without an ice cream maker. Do yourself a favor and give this homemade icy goodness a try. You can thank me later. Place beaters and a wide stainless steel vessel in the freezer for an hour. Chill the fresh cream in the fridge for 2-3 hours. Bring 3 1/2 cups of milk to a gentle boil and allow to simmer till it reduces to 2 3/4 cups. You have to constantly stir so that the bottom does not burn. Add the sugar and continue to stir till the sugar dissolves completely. Slowly pour the corn flour milk mixture to the simmering milk and go on stirring for 8-10 mts. The mixture will thicken. Turn off flame and completely cool the mixture. Place in fridge to chill. Remove the beaters, stainless steel vessel and fresh cream from the freezer. Pour the fresh cream into the chilled stainless steel vessel and beat the mixture well for 4-5 mts. Place the beaten fresh cream in the fridge until use. Beat the chilled milk mixture for 3 mts. 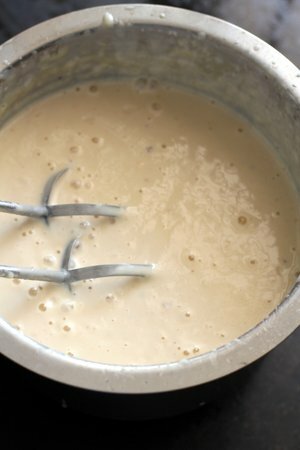 Add the beaten fresh cream and vanilla extract to the beaten milk mixture and beat on low for a mt or use a whisk to mix. Divide the mixture into two shallow aluminum containers, cover with plastic wrap and place in freezer. Remove the containers from freezer after an hour and use a spoon to mix the mixture for a mt. Break any ice formation by mixing thoroughly with a spoon. Place the containers in the freezer and again remove after 45 mts. Use a spoon to mix the mixture thoroughly for a mt. Continue this process two more times at 45 mts intervals. Once the mixture has been mixed/agitated at least 3-4 times, again place in freeze for an hour. Remove the frozen mixture from the container to a blender and blend well to a smooth mixture. Divide the blended mixture among the two shallow containers, cover with plastic wrap, place lid and freeze for at least 4-6 hours. Your soft, creamy, melt in the mouth ice cream is ready to be scooped and served. If you do not have beaters, you can use a mixer grinder. In step 2 above, you can boil the milk till it reduces to 3 cups instead of 2 3/4 cups. By Sailu Published: June 5, 2015 Ice cream recipe that's easy, eggless, without a machine or ice cream maker. How to make ice cream at home with a blender using milk & vanilla from scratch. cooked quinoa and keep aside. the melted ghee and sauté them for a minute. Will there be any taste difference if condensed milk is used instead of milk and sugar? And for how long will it stay good?